*30% saving is available to UK customers paying by Direct Debit only. You will pay just £25 every 6 months saving 30% off the UK cover price. All other savings are based on the local cover price for Europe, Australia and North America, and are available when you pay by continuous card payment only. 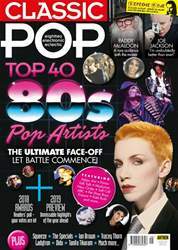 You will receive 12 issues of Classic Pop per year, starting with the next available issue. Minimum subscription term is 12 months.